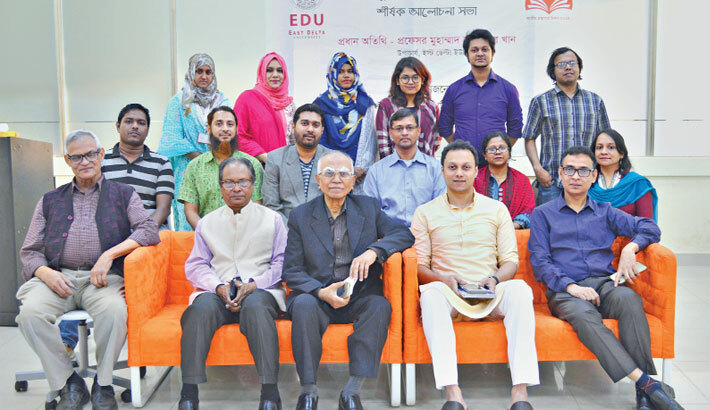 East Delta University (EDU) Vice Chancellor (VC) Professor Dr Muhammad Sekandar Khan emphasised the need for developing reading habit to build a prosperous country. He said this while addressing at a discussion organised marking the ‘National Library Day’ at Seminar Room of the university on Tuesday. The VC Professor Sekandar said scenario has now been changing as the books are not remained within the traditional paper and cover. “E-book has started to capture the space gradually in the world and books are now available in mobile phone and computer screens,” he said. Underscoring the need for modernisation of existing libraries in the country, the VC said demand for books is also increasing day by day. EDU founding Vice Chairman Syeed Al Noman said the university library was enriched with several thousand books of different authors from home and abroad. The initiative aimed at acquainting the students with the vast world of knowledge outside the text books, he said. “Knowledge for standard life and reading habit for knowledge are must. EDU is advancing with the thought,” he added. The vice chairman also discussed how the university library can be developed further. A ‘thought-board’ was also kept on the campus marking the day and students wrote their comments on it. The university Assistant Librarian Tahmina Afrad presided over the discussion also attended by the university Treasurer Sams-Ud-Doha, Director Syed Shafique Uddin Ahmed, Registrar Sajal Kanti Barua, School of Liberal Arts Dean Shahidul Islam Chowdhury, School of Engineering Dean Dr Md Nazim Uddin, School of Business Dean Dr Mohammad Raqibul Kabir, Proctor Ananya Nandi and other faculty members and students.